Routine house fire burns two members of FWBFD’s T-6 Co.
“T-6, R-6, B-6, DC-6, MEFD E-11, OIFD T-4, OIFD AC-4 responded to a working structure fire. Battalion 6 arrived first, reported heavy smoke and established command. T-6 positioned in front of the structure and R-6 pulled clear of the scene and reported back. B-6 requested another crew for R.I.T. and OCW E-3 was dispatched. The front door, front window and a window on side four were venting moderate grey/lt. brown smoke. The owner was out front, hysterical and being subdued by a bystander but was able to tell us that the fire started in the kitchen. The bystander with her stated that three dogs might be inside. T-6 Captain walked to side four and side two to evaluate the building. She noticed that the dogs had already escaped to the back yard. T-6 crew pulled a line to the front door as R-6 went to side three to ventilate. lot of debris in the yard as they approached the front door. They could also see that there was a heavy fire load inside the house. R-6 checked the windows on side three and found that two had already vented. They finished clearing the window openings and vented other involved windows and reported their findings to command. They then went to side two to stand-by to open a side door as T-6 made entry through the front. Battalion 6 came to the front door before T-6 made entry and advised them that the fire was located in the kitchen straight to the back. Just inside the doorway T-6 crew encountered heavy smoke and then vent point ignition occurred above them to their right side. The fire fighter behind the nozzle man and T-6 Captain yelled for the nozzle man to open the nozzle. After not feeling any change in conditions, T-6 Captain ordered the fire fighters out of the building. At about the same time the force entry FF noticed that the nozzle FF’s gear had caught on fire and the force door FF pulled nozzle FF out of the building. T-6 Captain pulled the hose line out to apply water to the nozzle FF’s gear. The flames on his gear were already extinguished, so the nozzle FF began applying water to the fire from just outside the doorway. T-6 Captain then assisted the second FF with the hose line, and the fire in the front room was knocked-down within seconds. This technique was shown to FWBFD members by Matt Rush of City of Austin Tx. FD also a FDIC instructor. 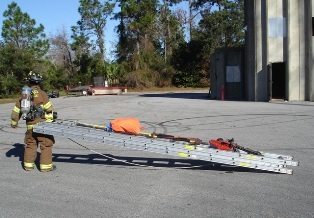 He is a great instructor on the uses of ground ladders and their possibilities, this is only one piece of the class that was put on for us, but important non the less. Big thanks to Matt. 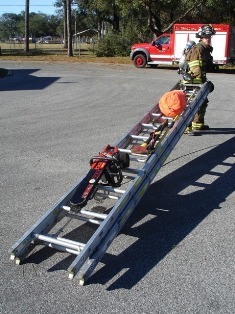 Load as much as you want onto the ladder (extend the hooks of your roof ladder and connect it to the top of the 24 to carry it) & make sure the items are secured. It is always easier to drag something than to carry it. 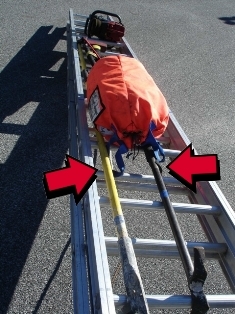 You can also use both pikes side by side to make a place to put the rope bag( or other smaller items that could slip through the rungs) onto the ladder. 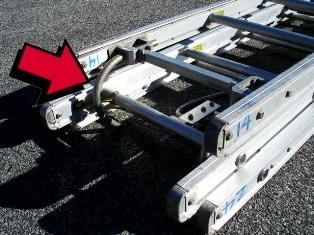 We also mark, with high visibility, the lengths on each end of the ladder, as well as mark the center balance point in order to identify the ladder more quickly(note the hooks). We are usually under staffed and operate with 3 so this is a great way for one dude to move a lot of stuff around to the rear or wherever. We found this one on you tube last week. This is why it SO important to put the Engine in the RIGHT place, blocking all oncoming traffic. A big heads up to all of you working the “bloody 98” corridor, Hwy 85, John Sims pky, I-10, etc. etc. Never let your guard down, the placement of this engine positively saved the crew & the victims lives! This video completely reinforces the fact that firefighter safety should NEVER be compromised by keeping traffic open. Most courts will rule that the accident scene belongs to the fire departments during the rescue portion of the incident and then becomes a law enforcement scene. We can help law enforcement out by taking note of vehicle tracks, debris fields etc. and trying not to disturb them. Two recent events besides this video emphasise the importance of not driving aggressively to scenes but defensively and also ensuring we communicate with law enforcement PRIOR to runs so we can spend on-scene time doing our jobs and not fighting one another. Click this link to read the story on a Lincoln, Nebraska fire truck that was involved in a crash after a car yielded to the apparatus but the car behind the yielding car was not paying attention and swerved to avoid the car and instead crashed into the truck. The state does have the “move over law” which is probably not enforced very well in our area. I know that on a lot of crashes we respond to on John Sims Pkwy or College Blvd, cars continue to drive past our parked trucks at breakneck speeds. We constantly remind each other to watch our backs and we make our responding crews wear orange safety vests on scene if bunker coats are not needed. I know that on the FHP website they mention how they just conducted a sting type of operation down South to target drivers who are not following this law. Maybe we need to campaign to get an awareness of this law out to the public whether it be Public Service Ads or asking law enforcement to step up their enforcement. This law is to protect ALL responders for a reason. Bottom line is that the officer on that truck in the video did his job by ensuring the driver parked in the correct spot and did not compromise the safety of his/her crewmembers. Kudos to him for taking care of his crew first. In other words, knowing what you are responsible for and what you are going to do before the alarm comes in. I have trained with this search technique a lot throughout my career but did not give the pre-assigned responsibilities much thought until training one day with Midway Fire Department Lieutenant Larry Brewer. He explained to me how he pre-assigns duties with his guys on Ladder Co. 37 and train consistently on these responsibilities. After he explained it to me, the light came on! I have done this numerous times in my career where I sit back and think “Man, why didn’t I think of that…it just makes sense”…. Let us know what you think, how do you do it?, suggestions? Ideas?